Dating from Tudor times, Swan’s Nest is a Grade II listed country house which has been extended and updated during the late 18th and early 20th centuries. Presented to a high standard throughout, the house now offers excellent family accommodation. Two elegant principal reception rooms have working fireplaces and the sitting room has a gas fire, while a comfortable conservatory provides excellent views of the garden. A wine cellar sits below the well-fitted kitchen, which also benefits from a larder. A fine old oak staircase leads upstairs where the central landing gives access to the five main bedrooms (three en-suite), together with the sixth bedroom which is currently used as a study. Outside the formal gardens include a natural pond to the front and well-kept lawnswith mature trees including ash, holme oak, a maple and a rare black poplar, as well as an ancient mulberry tree. West-facing terraces include a brick barbecue and ornamental pond; beneath a colourful rose border is the croquet lawn with steps leading to the tennis court. 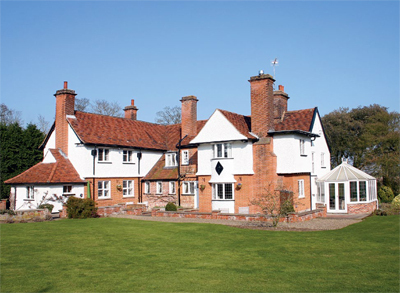 Swan’s Nest is located on the edge of Westerfield and the centre of Ipswich is just two miles. The guide price is £1.1m. For further information please contact Jackson-Stops & Staff on 01473 218 218 or visit www.jackson-stops.co.uk.